There are a ton of crafty recipes that come out around the holidays. 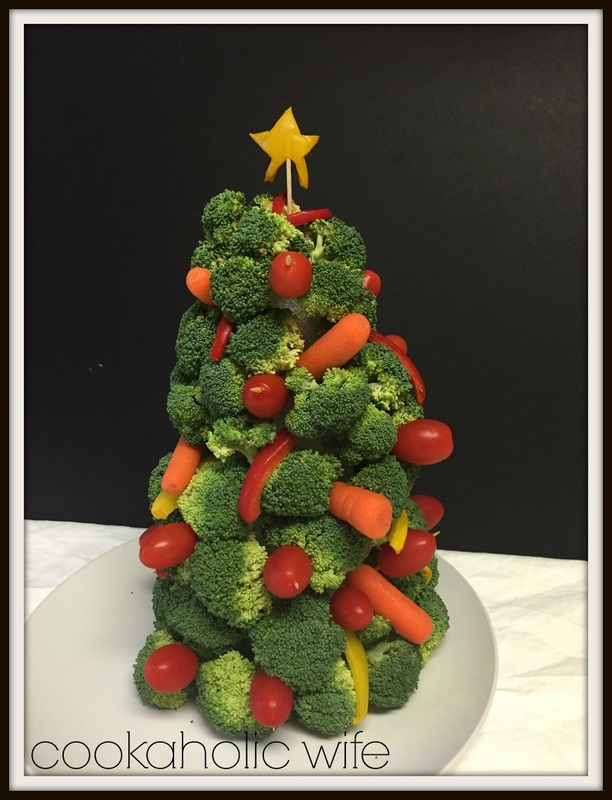 Vegetables, fruits and cheeses are usually the dishes that get turned into something fun for the holidays; like a turkey made from a cheese ball or fruit arranged on a tray to make the shape of a rabbit. A bit late, but I decided to get in on the tradition and transformed a bunch of vegetables and a styrofoam cone into a Christmas tree for the holiday party I had the other week. I enjoyed making this so much I decided to make a smaller version on Christmas (in hopes it will actually get eaten) and also a gumdrop one because I have a ton of leftover gumdrops from some recipe. Other recipes call for hot gluing the cone to a tray to make sure that it stays put while you’re decorating it with veggies, but I don’t own a hot glue gun and was not about to buy one for one craft. Mainly because it would lead me to believe that I’m crafty and I’m definitely not. 1. Cut the broccoli into florets making sure to leave enough of a stem to stick the toothpick in. 2. Spear each floret of broccoli with a toothpick and starting with the larger pieces being sticking them into the bottom of the cone, working your way around in a circle. Don’t worry if there are gaps. 3. When you get 3/4 of the way up the cone you’ll need to start cutting your toothpicks in half so they don’t poke through the other side of the cone and the vegetable. 4. Slice the red bell pepper into thin strips. Free cut or use a cookie cutter to cut a star out of the yellow bell pepper. 5. Wrap the bell pepper slices in between the pieces of broccoli. Use the toothpicks to skewer the tomatoes in between the broccoli pieces. Wedge the carrots in any other gaps. You won’t need a toothpick for those. Stick the star yellow pepper on the top of the tree. 6. Serve with dip and additional veggies. *Each package of broccoli I bought was a large head and a smaller one. I used 2 1/2 packages, but this will depend on how you cut the florets. 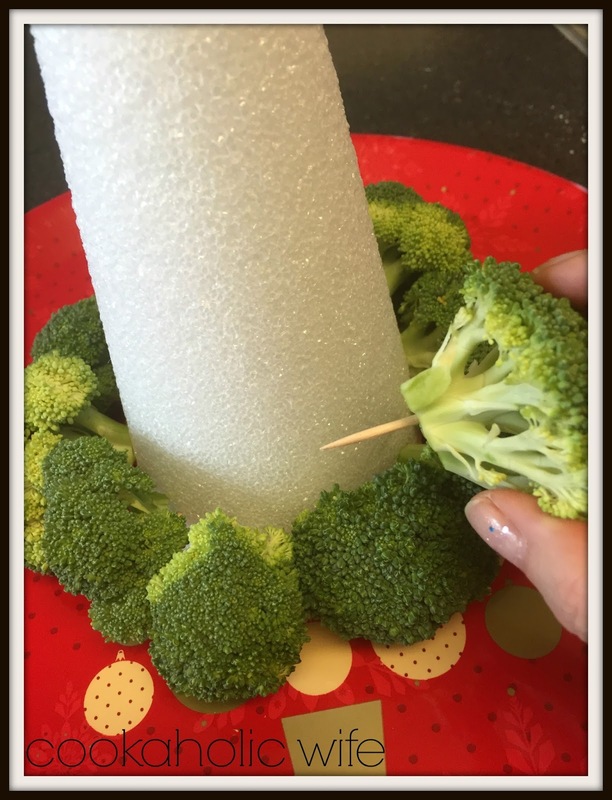 **If you aren’t gluing the cone to the tray, spin the tray around instead of the cone as you are building the vegetable layers up. 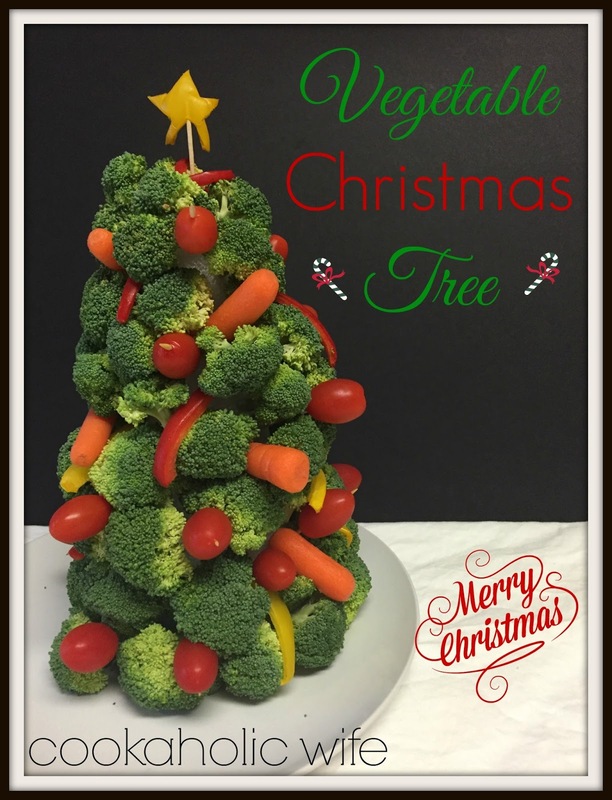 ***This can be made a few hours in advance if you loosely wrap the finished tree in plastic wrap and refrigerate until ready to serve. 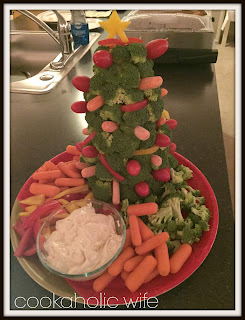 No one wanted to eat the tree. They kept saying it was too cute. So fair warning, you might make this tree and find that no one wants to eat it because they think it’s too pretty to eat. Encourage your guests to do otherwise!